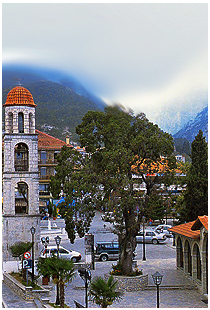 Litochoro, a picturesque tourist resort, known as the "Gateway of Olympus"
Litochoro, the "City of the Gods', situated at the foot of Olympus, at an altitude of 300m., is a unique combination of mountain and sea. A picturesque and hospitable tourist resort, with rich religious history and a great maritime tradition, is the second largest city in the prefecture of Pieria with 7000 inhabitants. It is worth visiting the Monastery of St. Dionysius, the Municipal Park, the Maritime Museum.